I really dislike this cliché “This will change your life” but, in this case, sleep will literally do so. What happens to us during sleep is truly remarkable. It is the ultimate detox for the mind and body. It is a reset button. A reboot. In fact if there was a magic elixir or superfood that could help you live not just a longer life but a beautiful one, make you look young, boost your brain power, boost your performance, improve your relationship, make you fun and attractive to friends and family, energetic, enthusiastic…etc, you would mortgage your house for it. You would travel miles to get it. Humans are wired to value scarcity. So, we go in search of elusive superfoods or medicinal herbs that grow in unique parts of the world. But we ignore the most potent health protocol that is available to us for free every night. SLEEP! This article is not just about giving the usual list of tips for sleeping better. That is secondary and found all over the internet. I write this article with my lawyer hat on to convince you intellectually of the importance of sleep. Only then will you start to respect sleep. In my experience of coaching myself and clients, behavioural change will never happen unless you have complete clarity of why you are doing something. So, I will be sharing the science of sleep and how it impacts every part of your life. When you really understand what goes on at a cellular level, this will have a profound emotional impact on you and motivate you to take sleep more seriously and make the lifestyle changes I will be recommending later. Straight up, I am not a sleep expert. But I research and retain information really well and I have studied this area for many years and read multiple papers and books by pioneering scientists, especially in the last 2 years, where there have been huge advancements. I have also tested the protocols personally and documented the impact it has had on my own health and performance (I do this with the help of my Oura Ring, which gives me all the data I need to track the results of every sleep protocol I implement. As an entrepreneur I often say that “data provides the clarity for business strategy”. That is no different in your personal life. All my learnings have culminated in this article which is an excerpt of a chapter from my next book, Living Longer Looking Younger. It serves as a quick reference summary. It is perhaps the most important article you will read from me this year. It is a little long, but I make no apologies for that. I respect you too much to give you a cursory summary of what I think is the most important element to your wellbeing that impacts not only your physical but also your mental and emotional health. Sleep happens in cycles typically of 90 mins duration. So over an optimal 8 hours sleep you will get 5 cycles. During this 90 min cycle you go into 4 levels of sleep. Level’s 3 & 4 being the deepest sleep where your brain goes into long ‘delta’ waves. Towards the end of the 90 min cycle you go back up to REM sleep (they call it Rapid Eye Movement because that is when you do your dreaming). As the night progresses and you go from cycle to cycle you have less delta sleep and more REM sleep, which is why you tend to dream more in the morning hours. Imagine it like going up and down a ladder 5 times per night. You will notice from the diagram below that most of your deep sleep happens early in the evening. Typically this peaks during the second cycle. And this is when you go into a state of autophagy (promotes longevity) and experience a surge of human growth hormones (promotes youth). There are 4 layers to your health: Physical, Intellectual, Emotional and Spiritual. In this article we will discuss how sleep impacts the first ‘3 energies’. The depth, duration, continuity and regularity is what defines high-quality sleep. And it is the combination of all 4 elements that increases your ability to activate ‘autophagy’ and HGH. Research shows that dysfunction in any one of these four factors negatively alters sleep and accelerates ageing and disease. Depth is how deep your sleep is. Duration is the length of sleep. Continuity is how long you sleep without waking (especially important in the first 4 cycles). Regularity is how often you experience quality sleep. Every day? 5 times per week? How does sleep Impact Your PHYSICAL? Long wave deep sleep is critical for activating a mechanism called ‘autophagy’. The mechanism was recently discovered in 2016 by Nobel prize winner, Yoshinori Ohsumi. It is a scientific term meaning your body goes into self-cleaning mode. It leads to the regeneration and repair of all your cells throughout the body via the lymphatic system, and the brain, via the glymphatic pathway while you sleep. Simply put, it destroys the old, damaged, and malfunctioning components of your cells – and rebuilds new and healthier ones. It’s like an overnight spring clean to replace old cells. So, autophagy is your body’s unique way of naturally rejuvenating and defending itself from disease. Lack of good quality and quantity of sleep will cause a dysfunction with the mechanism of autophagy. The mind in particular will experience an abnormal build-up of B-Amyloid plaque on the very part of the brain which facilitates sleep – the pre-frontal cortex. Over time, this leads to even more sleep dysfunction which clogs up the brain even more, accelerates cognitive ageing, and contributes to the development of early onset dementia and Alzheimer’s. (Reference: Dr. David Rubinsztein, professor of molecular neurogenetics at the University of Cambridge). When it comes to the body, poor quality sleep predictably leads to a multitude of physical ailments like auto-immune diseases from increased inflammation; poor thyroid function; increased insulin/glucose resistance (pre-diabetes); shortening of your telomeres (these keep you young); skin ageing; eyesight dysfunction; cardiovascular disease; and a dramatic increase in the risk of cancer. In relation to cancer, studies also show that shorter duration of sleep has been found to reduce the number of natural killer T cells by up to 30%. T cells are what fight cancer cells. Over time, chronic sleep deprivation of under 6 hours per night dramatically increases the risk of cancer, especially coupled with the lack of exposure to daylight and lack of vitamin D.
Interestingly, the research also shows that poor quality sleep tends to increase the amount of food you eat. It increases ghrelin cells which lead to an exaggerated hunger response. High quality sleep on the other hand increases leptin cells. These cells inhibit hunger and regulate energy balance, so the body does not trigger a hunger response when it does not need energy. Additionally, poor quality sleep increases your cravings for the wrong foods. This is because the lack of sleep impact your gut health. Poor sleep leads to an overgrowth of bad bacteria that crave the wrong type of foods, typically, high in sugar, fat and salt. In fact science is now showing that good quality sleep from a healthy circadian rhythm is more important than pre-biotics and pro-biotics in the regulation of good gut health. If this is not bad enough, research shows that people who get 6 or less hours of sleep per night are 4 times as likely to get ill after being exposed to the flu virus. But wait, there is more. Poor quality sleep reduces testosterone levels, which is critical for your libido (and relationship), fat metabolism, muscle strength and bone density. Still need more evidence of the importance of sleep? Let’s move to the impact on your mental and emotional health. How does Sleep Impact Your INTELLECTUAL? Poor quality sleep (especially influencing depth and duration) impacts your cognitive and work performance in a profound way. As we enter this age of automation and artificial intelligence, the key skills of creativity, imagination and strategising will become super important to your success. Sleep impacts all of these 3 key skills in a profound way. In a recent study performed by the team at Berkeley University led by Professor Matthew Walker, they stunningly found that even one night’s sleep deprivation impacted cognitive performance by 40%. This is a huge impact. They found that you need sleep to prime the brain before learning and processing new information, and you need sleep after learning to retain or store that same information you learned. So, sleep before, stores information in the short-term memory (the hippocampus part of the brain) and deep sleep after allows you to transfer that same information into your long-term memory (the cortex). This allows you to reset your short-term memory for use the next day. So, if you do not get enough deep sleep, your short-term memory does not reset efficiently and therefore impairs your ability to learn and process new information the next day, because that part of the brain has a limited storage capacity (approx. 16 hours). Think of it like a USB stick. Therefore, a good sleep of depth and duration will have the benefit of clearing your short-term memory reservoir for use the next day. How does Sleep impact Your EMOTIONAL? There is a strong correlation between a high EQ and personal performance. Poor quality and quantity sleep impact your emotional stability. It increases activity in the emotional part of the brain (the amygdala), which becomes 60% more reactive due to the dampening down of your rational brain (the pre-frontal cortex). This is an immediate trigger for anxiety which in turn negatively impacts your ability to sleep. This leads to a vicious cycle of sleeping less and experiencing higher anxiety. Dr Walkers research lab shows that this negative loop eventually leads to social isolation because people who are sleep deprived show a strong tendency to distance themselves from social interaction. Moreover, it showed that the issue was compounded because they were in turn shunned by others; which caused more social isolation and inevitably depression. This is what the “R U Ok” movement is essentially trying to avoid. Depression causes your hippocampus to shrink, which then impacts your short-term memory, which as I outlined earlier, is critical for your creativity and strategic thinking, and therefore your performance at work and in business. Poor sleep also amplifies the stress response in a unique way. Your tolerance level drops, your irritability rises, and you are quick to anger. Hardly good qualities for optimal work performance. In fact, the negative emotions of anger, fear, anxiety and depression (even general unhappiness) will drain your physical energy and this dramatically reduces your effectiveness in all areas of life. 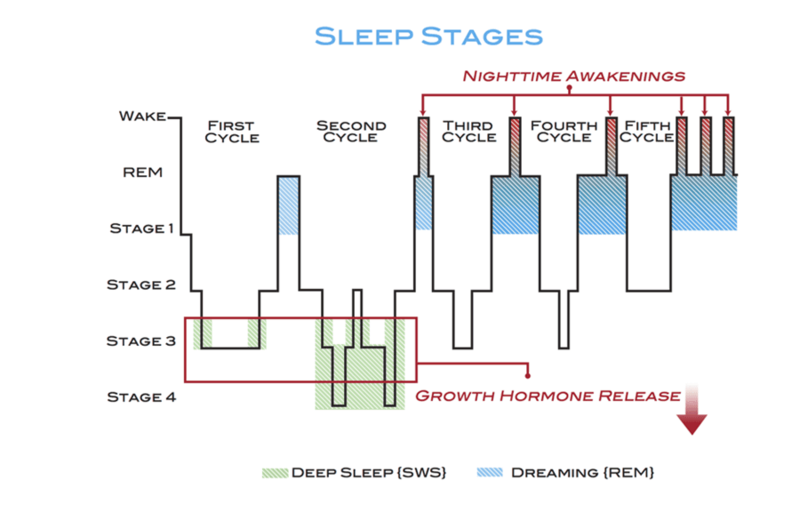 Depth: The two MAJOR lifestyle changes that will increase the depth of your sleep and activate autophagy and trigger HGH. These protocols will work almost immediately. Duration: The two MAJOR causes for a reduction in the duration of your sleep. And how to prevent them with two simple techniques. I will also share with you 7 techniques that will induce sleepiness so you can get to sleep on time every night. Continuity: The three MAJOR reasons why you are having interrupted sleep and how to sleep through the 3 sleep cycles of the night where you are most prone to waking. Refer to the diagram above. Regularity: How sleeping according to your chronotype can increase regularity, especially during travel and work commitments. I will share the exact best time to sleep and wake according to your chronotype.